What’s your favorite song, and why? There can be many reasons, none inherently right or wrong; perhaps we simply enjoy the way it sounds. Maybe relevant lyrics and catchy melodies stay in your mind through the day. As a guitarist, many of my favorite songs feature improvisation that tells a story with great vocabulary, technique, or harmony. The standards for a solid worship song, however, introduce another element: theology (knowing God) dictating doxology (how we worship God). A song that is pleasing to the ear, with relatable lyrics, may be inappropriate for congregational singing when they fail to speak of God accurately; cliche-driven consumerism is a common issue in contemporary CCM. You can read the lyrics at the link below. Here’s a video of the original hymn, sung by the Metropolitan Tabernacle. While revamped hymns bring classic lyrics to a new generation’s culture, it’s often seen as needless sacrilege or profiteering. Many Christian artists have rearranged hymns, and still more have voiced their opinions on it. The “chains are gone” chorus strikes me as shallow in comparison, and can’t quite replace the original’s emphasis on trials, human weakness, and God’s glory. Red Letter’s version of “My God My Father” also omits two verses, about “lonely grief… for friends beloved, no longer nigh” and “my life in premature decay.” Though we cannot judge the intent of either Tomlin or Red Letter, I do wish all the verses were preserved. However, there are several musical choices that elevate Red Letter’s version of Elliott’s hymn. The usual pop format – verse/prechorus/chorus twice, then bridge/chorus, with some variation – repeats various melodies so people can follow along. However, this limits the room for lyrics, and popular worship tunes end up theologically shallow in favor of a radio-friendly format. This is where My God My Father’s multiple-stanza format, has the advantage. Changing the lyrics in each stanza gives thematic variation, while still utilizing a memorable repeated melody. As a result, the song’s narrative takes center stage. One great example from outside the CCM genre is John Mayer’s song, “Walt Grace’s Submarine Test, January 1967.” The verse – refrain form repeats three times, allowing the story to pull you in. As a collection of stories which tell one cohesive narrative – the Gospel – the Scriptures are well suited to this song form, giving the songwriter room to flesh out sound doctrine. When I was introduced to this tune upon visiting Center Church, I didn’t notice the usage of odd time in the verses; the best odd time songs flow very naturally. I’ve transcribed the verse and chorus parts below. 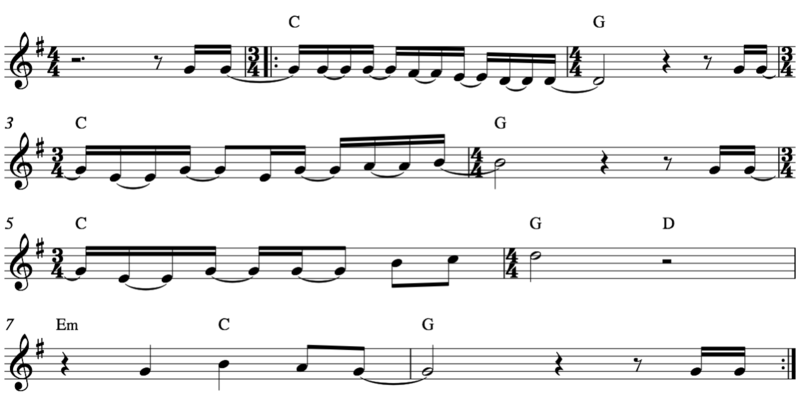 Red Letter’s usage of this rhythmic device, among others, support the lyrics in a profound way. 1) Rhythmically, the syncopated melody begins on a sudden and unexpected pickup, consistently emphasizing upbeats, and never landing on a satisfying downbeat. This reflects the verse lyrics thematically, as they express the difficulties of following Christ: “life’s rough way,” “though dark my path and sad my lot,” etc. Surely you and I have felt similarly displaced, confused, and uneasy in the light of these trials. 2) The phrasing transitions from 3/4 to 4/4, and doesn’t quite land how you’d expect. The measures of 4/4 on the root chord give a temporary reprieve and resolve after “thy will be done,” only to resume the tense odd phrasing in the next bar. Pauses allow a moment for the congregation to meditate and reflect on what was just sung: in this case, the constant back-and-forth spiritual battles. 3) Harmonically, each line begins on the IV chord, imparting a sense of motion. The melody itself rises each time the 3/4-to-4/4 phrase is repeated; the first descends to a D, the second lifts to a B, and the third rises to a D. This reflects a rise in tension and emotion. The speaker is recognizing the emotional weight of the task before him: submitting to the Father’s will amidst trials. 1) Rhythmically, there is an unexpected quarter note pause in the second to last bar. I imagine the speaker taking a moment to gather his strength. Then, the melody shifts from emphasizing upbeats (the “e” and “a”) to landing on downbeats: “thy” on beat 2, “will” on beat 3,” and “be” on beat 4. In contrast to the first three upbeat phrases, this rhythm is much slower and natural than the preceding, syncopated upbeats. It gives due emphasis to the lyrics, showing the speaker’s focus on God’s will. 2) The phrasing is now consistently in 4/4. Needless to say, this time signature is more natural for our Western ears, and our rhythmic sense is instantly at home. It succeeds at communicating the simple “peace beyond all understanding” derived from focusing on God’s will. 3) Harmonically, while simple, I appreciate the vi – IV – I progression in the last pharse. It is surely difficult to initially submit to the Father’s will when things don’t go our way, and replacing the C with an Em chord reflects this. The following plagal cadence (C-G) is classic and familiar, further emphasizing the peace that comes afterwards accepting the Father’s will. While subtle, these small choices go a long way. In my prayer life, I find myself able to better comprehend the situation when I stop my rapid-fire talking and ranting, choosing to focus on simple truths by the Holy Spirit. These theological truths are often simple and eternally consolatory. And yet they are hard to swallow. Despite how familiar we are with the phrase “thy will be done,” how many of us have truly accepted it? I feel this reflected in how many times “thy will be done” is repeated, only to be followed by the tense and uneasy feeling in the following verse’s first three lines. And in this song, it repeats four times in the first four verses! Have you ever experienced having difficulty accepting something you know is true? You probably had to repeat it over and over – almost preaching to yourself – for an extended period of time before you believed it. In contrast to other worship songs that do not ground the weight of their motivational lyrics in reality, the honesty of “My God My Father” is incredibly refreshing. So the refrain is well earned as the lyrics slowly grow in confidence. Lyrically, the speaker wants God to “renew” his will, acknowledging that while God’s will is strong, his own will to change is not. Asking God to “take away” what hinders him implies recognition of his own inability to let go. The speaker becomes willing to repent and make sacrifices to align with the Father’s will. And the arrangement intentionally backs up this message. Firstly, it is in 4/4 throughout, introducing a steadier drive. Furthermore, the chords rise through IV – V – III7 – vi twice, and the secondary dominant towards the vi chord adds tension. The author, despite the inevitable pain and struggle, calls on God to intervene, as reflected in the harmony. The ending verse then looks forward, to after the speaker “breathe[s] no more.” On “that joyful shore,” where prayers are no longer “mixed with tears,” the line “thy will be done” is tagged 4 times. Perhaps this is merely done for emphasis, though in my mind I imagine the church praising God for eternity. This theological hope is necessary to comprehending and overcoming our own personal struggles. It is evident that Red Letter wanted to tell a story, and was willing to make appropriate musical choices, introducing and resolving tension at the correct moments. An additional benefit to arrangement with real thought put into the melodic, rhythmic, and harmonic construction: a song that sounds great, no matter how large or small the band is. In contrast, weak arrangement is often masked by heavy production, lacking connection to the song’s message. The result: songs with empty lyrics. While backed up by excellent – yet unintentional and haphazard – production, this can come off as emotionally manipulative, and impossible to duplicate at local congregations with limited musical volunteers/skillset/resources. But when these same harmonic/rhythmic devices are used to back up theologically solid lyrics, they are not emotionally manipulative. Rather, if any emotions are stirred, they are stirred in response to undeniable truth. The congregation is taken on an emotional journey in response, internalizing the difficult truth of submitting to the Father’s will. Furthermore, these devices are in play no matter the production level of a local church, and the strength of the song is emphasized. Thinking of arrangement in this way frees musicians to make creatively satisfying and musically fun choices that impact the spiritual lives of congregations and listeners. Once again, let’s ask our initial question: what’s your favorite song, and why? I hope this has introduced some new concepts to listen for. If you are a Christian, I hope and pray that you would grow in musical maturity and discernment, as we declare theological truths with musical storytelling.